Hawthorn Medical provides occupational therapy services for upper extremity disease and injury. The Occupational Therapy Department staff specializes in hand therapy and currently includes three certified hand therapists who have many years of experience. Hand therapists specialize in the care of post-surgical and non-surgical shoulder, elbow, forearm, wrist and hand conditions. 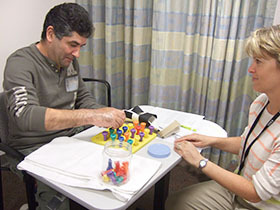 Occupational therapy services are provided to pediatric, adolescent, adult and geriatric populations. Brenda Cabral, OTR/L, CHT, is a 1996 graduate of Worcester State College. She specializes in evaluation and treatment of patients with neurological disorders and upper extremity orthopedic conditions. Brenda recently achieved certification in hand therapy. Deborah Days Fraine, MS, OTR/L, CHT, our Occupational/Hand Therapy Manager, is a graduate of Tufts University, Boston School of Occupational Therapy. Deborah has more than 21 years of experience. She has been a certified hand therapist since 1999 and is a member of the American Society of Hand Therapists. She has expertise in the treatment of the shoulder, elbow, wrist and hand. Deborah has special interest in pediatric upper extremity congenital conditions, splinting and traumatic hand injuries. Kimberly Green, OTR/L, is a 1991 graduate of Quinnipiac University and has more than 20 years of occupational therapy experience. She specializes in neurological conditions and upper extremity rehabilitation. A physician referral is required to begin assessment and treatment. Patients will be assessed and individualized plans based on the individual diagnosis and physician orders. If you need to cancel or reschedule appointment, call 508-996-3991. We ask that you give 24 hours notice. Please bring your physician referral with you. Be prepared to start your therapy at your first visit. Wear a short-sleeve or sleeveless shirt. It is important for you to understand your insurance coverage for treatment. Because insurance plans vary in their coverage of occupational therapy, it is your responsibility to contact your insurance carrier to determine eligibility, benefit information and authorization for services. Hand therapists specialize in care of post-surgical and non-surgical shoulder, elbow, forearm, wrist and hand conditions.